Here's an 11-minute explainer video that will go much deeper or you can read the quick book summary here if you want to learn more. 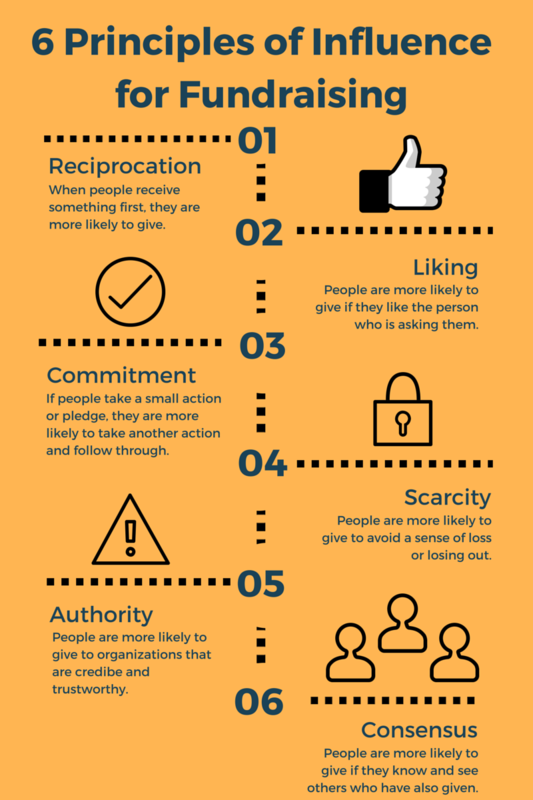 While all of these principles are relevant to nonprofit marketers and fundraisers, as they provide deeper insights into human behaviour, 5 of them, in particular, are more interesting to consider and put to use in your work. Most often used in the world of direct mail as a tactic (you know, where we give people crappy trinkets and mailing labels in our appeals to boost their giving...) and alumni fundraising where the focus is on giving back, or repaying. At Opportunity International, we let donors use an estate and will planning service, free of charge, as a benefit to them even though they did not have to choose our organization in their wills to use the service. Giving people a great volunteer experience, creating a simple tax calculator on your website and sending a tax-time reminder are all various forms of the reciprocity principle. What are some small ways you can benefit your supporters before they are asked to give or fundraise for you? This is one of the most interesting ones for me, especially as it relates to the 'slacktivism' conversation. By getting someone to make a small action or public declaration, they will then be more likely to follow through on that action. This is partly why the 'slacktivism' conversation focusing on 'Liking' items on Facebook but then not giving isn't totally accurate. If they asked people on Facebook to "like this post to pledge your donation" or something like that and then they did not give when followed up with, that would be different. But the small action needs to remain connected to the bigger action and the person's expectations of action and reward. So how can you use this? Get pledges. Of all different kinds. Pledging is nothing new but we can use the pledging concept in new ways. Have people pledge their birthday's as fundraisers throughout the year (like charity: water), pledge via a text or Tweet or ask people to commit, preferably in public, the 5 friends they will invite to the event this year. We have much greater communication and social channels but instead of using them to take the user/donor from 0 to 60, why not try to take them from 0 to 30 and then find other ways and mediums to take them from 30 to 60. There are three main ways fundraisers can use the scarcity principle: 1) in your communications and messaging 2) in your campaigns and appeal strategy and 3) in your rewards and recognition. People are often much more motivated to avoid loss as opposed to giving for positive outcomes which is partly why the "we need your support or we won't be around next year" appeal performs so well. Just by changing the focus from helping to not helping, from 'with your support we can...' to 'without your support we can't...' for example, you might be able to boost response rates. I'm a fan of 'crowdfunding' more because of what it forces into campaign strategy. Things like tangibility and scarcity are littered throughout. There is only a certain amount of time to give. There is only a certain amount of perks at each giving level or matching funds remaining. Using time and incentives with maximums, the campaign itself becomes more scarce. Maybe for a monthly donor drive, you only have 50 'slots' available and make that information public. Or for a campaign, you only allow a certain amount of lead donors. Lastly, scarcity can be used in the form of a reward. Contributors or fundraisers for a campaign are the only ones to get the special report on the project (or they get it first). Monthly donors get reserved seats to the annual gala. First ticket purchasers get to attend the VIP pre-event. Scarcity can increase incentive in simple ways. Authority is a way to gain credibility and, according to Cialdini, that largely comes from being knowledgeable and trustworthy. Most nonprofits have some serious knowledge and expertise when it comes to program or service delivery. At Opportunity International, for example, we had Ph.D.'s, teachers at prestigious schools and mega thought leaders shaping our strategies. But I didn't do a great job of making that known in simple, non-braggart ways. Even just having their professional designation attached to their names can make them see more knowledgeable. Trust in the charity sector is a massive issue. One that very much needs to be discussed but often the conversation is misguided right now in terms of what is or is not a trustworthy organization. Part of the reason why financial ratio's and corresponding 'seals of approval' are so rampant is that they were a quick way to establish trust - even if donors don't know what that actually means. My hope is these seals and programs will evolve to be more impact based as they can play a key role in developing trust in the sector. Publishing your financials and annual reports, having donor testimonials and admitting your own mistakes are all different ways of establishing trust and gaining more authority. Also known as "social proof" showing the number of other contributors to a campaign or who else is fundraising, especially with names and pictures, helps signify that there are other people involved and maybe you, the potential supporter, should join. Cialdini told the story of a study they did at hotels trying to encourage their guests to reuse their towels. They put a sign in the washroom saying "75% of our guests reuse their towels" and it increased the reuse rate by 33%. And when they contextualized the statement with "... guests staying in this room..." the reuse rate increased even more. We are generally uncertain when it comes to making decisions. That's why 98% of us consult online reviews before we buy a product nowadays (according to Cialdini). Knowing that others have supported or purchased helps give us more certainty. There are other people who support you and your cause, make sure new and potential supporters know that. Understanding human behaviour and the impact of influence is key for any business, marketer or salesperson. By focusing on principles like reciprocation, commitment, scarcity, authority and consensus, fundraisers can help move their supporters and potential supporters further down the path and closer to 'yes'. This was originally posted on re: charity and can be read in full here.